Guest article by Mr. D. Henley (SB5 Fan) – As the ‘NEW KID IN TOWN’ during SB5 2013, our next challengers quickly discovered there’s a lot more to BEACH 5s than meets the eye. There’s no way any squad can ‘TAKE IT EASY’ in the heat of the LIGNANO Beach Arena. With end-to-end, non-stop action, time flies in a ‘NEW YORK MINUTE’. You snooze – you lose. Almost 12 months on, the good news is they’ve dusted themselves down and are making ready for the almighty task that lies ahead. We’re honoured and delighted to welcome back, Challenger #9 – THE EAGLES. 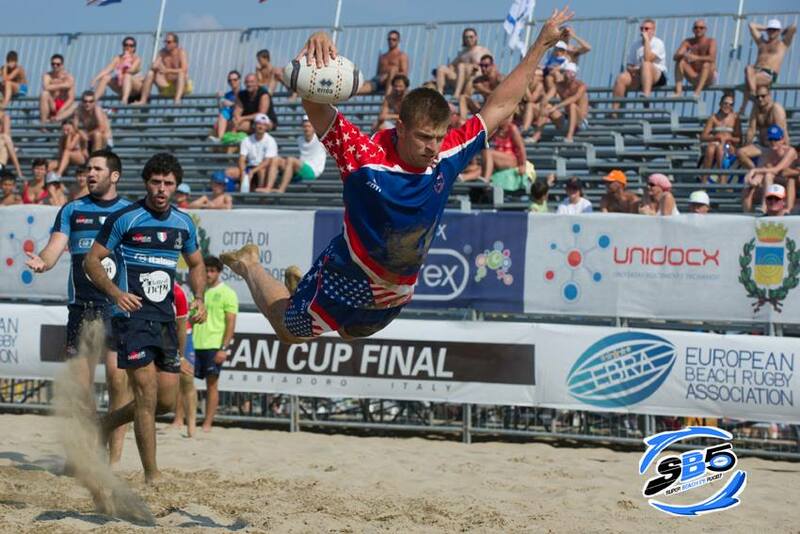 Even though the 2013 results didn’t go their way, the Lignano experience proved a valuable one for the first Amercian squad to join the ranks of SUPER BEACH 5s. For sure it wasn’t ‘WASTED TIME’. Afterall, if US Rugby has learned one thing in recent years, it’s that there’s much to be gained from participation in Rugby’s shorter formats. US Rugby Sevens is a perfect case in point. As we all know, they continue to consolidate their lofty position the IRB Sevens world rankings. There’s no denying that success breeds success and one would imagine that BEACH 5s could offer our continental cousins a similar platform on which to build the sport of Rugby Stateside. So what have the EAGLES got planned for SB5 2014 ? Well, the word is they’ve assembled a dynamic unit including the experience of Charlie Hurst, Spencer Goggin and Alex McEwan. But will they have what it takes to live ‘LIFE IN THE FAST LANE’ ? Remember folks….each match lasts a mere 10 minutes….that’s 600 seconds to victory ! It doesn’t get any faster. Looking for speed ? ….also the only place to see ‘THE EAGLES LIVE’ this summer ! SUPER BEACH 5S RUGBY. The Fastest Game of Rugby on the Planet.